DCNR Secretary Cindy Adams Dunn last week joined Bureau of State Park officials and equestrian enthusiasts in dedicating a new indoor equestrian arena that will extend riding opportunities at Ridley Creek State Park, near Media, Delaware County. 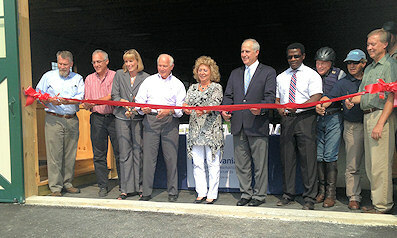 Ridley Creek State Park's new indoor equestrian arena was dedicated Sept. 2 by DCNR Secretary Cindy Adams Dunn (third from left); state Sen. Dominic Pileggi (sixth from left); and many friends and supporters. Hailing the building as the “ultimate in private public partnerships,” the secretary noted the indoor arena has created an increase in visitor services at the park and strengthened a partnership between concessionaire and park. Under a long-term lease agreement, the Chidesters have operated Hidden Valley Farms of New Town Square at Ridley Creek State Park since 1999. The secretary noted that, just as the equestrian facilities are an integral point of Ridley Creek State Park, horseback riding and equestrian trails are engrained in both state park and state forest public use across the state. The arena was built by King Construction at a cost of $600,000. 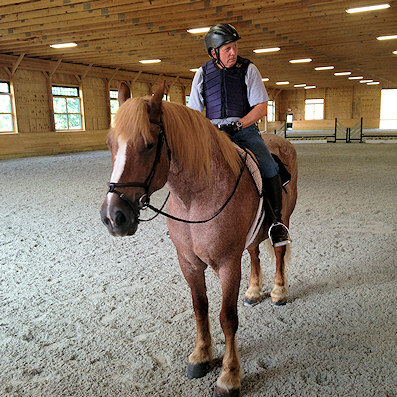 Longtime boarder Tom Buchannan gives a riding demonstration in the newly dedicated indoor equestrian arena at Ridley Creek State Park, Delaware County. Details on Ridley Creek and Pennsylvania’s other 119 state parks can be found here.